The Amantii 26″ WM-BI-2428-VLR-BG Wall or Corner Mount Insert Electric Fireplace has a High/Low 1500W/750W heater with fan. With 3 Installation options: built-in, wall mounted flat, mounted across a corner the smart looking WM-BI-2428-VLR-BG electric fireplace is one versatile fireplace. It comes with deluxe log set installed, 4 stage front and 4 stage internal back lighting. 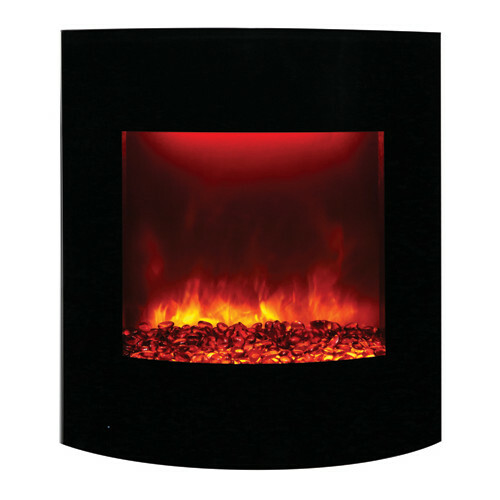 The modern WM-BI-2428-VLR-BG fireplace features an extra deep tray and new steel surround. It can be hard wired with a remote thermostat, and comes with deluxe log set installed. This fireplace comes with large glass nuggets, clear & blue diamond decorative media and an 11 piece log set. It also features the vibrant Fire & Ice flame set, which with just a click of your remote, you can easily change the flame color from blue to purple to violet to orange or yellow. glass for a “clean face” design or using the provided black metal surround.